@13nova i like these basics. Are they APAC? @peach It would be great to get a Steel Sabotage with Cookie Monster eating a Black Lotus. Still very nice, I want to get mine done at some point. Dual lands, all altered by the original artists. Sets sorted left-to-right in terms of the order I like to fetch them in. Unfortunately, Snody wasn't doing alters at Seattle, so Volcs remain offscreen with a handful of other less powerful duals. @thecravenone How long did it take to get the Rob Alexander alters back from him? For me him and Tedin were a long wait. All of these were in person with me standing there waiting except for the Badlands. Which was dropoff and pickup on various GP weekends. 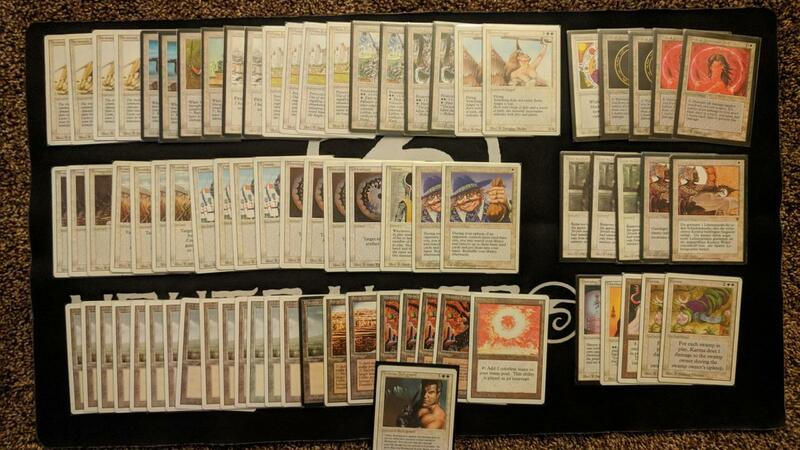 It isn't much but one of my oldest magic friends is turning 30 this year so I decided to make him an Old School deck for him to play at Eternal Weekend this year. Mostly revised but those beta Circles aren't too shabby! I've been working on JPN White Eldrazi over the past year and just got my final 3 Caverns in the mail today, so the deck's done! A few of my favorites from my collection. Love the thread!